Expand your digital life by storing much more photos, videos, music and files on the LaCie mini Hard Drive & HUB, specially designed to fit perfectly with the Apple Mac mini. Now you can connect all of your hardware peripherals at once - like your isight, mouse, keyboard, web cam, camera, video recorder, speakers and other USB hard drives. Easily back up your computer or upgrade storage capacity, whether on a Mac mini, or another desktop or laptop computer. This multiple-connection companion is plug & play, cross-platform and ultra-quiet. Its sturdy metal casing provides advanced heat dissipation and its unique four-corner crown is designed to provide cooling airflow between stacked drives to protect against overheating. 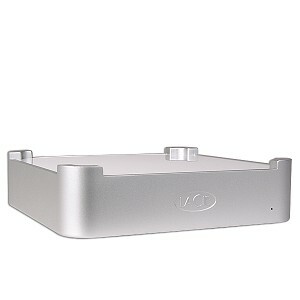 LaCie 500 GB Desktop Drive Mini HubExpand your digital life by storing much more photos, videos, music and files on the LaCie mini Hard Drive & HUB, specially designed to fit perfectly with the Apple Mac mini. Now you can connect all of your hardware peripherals at once - like your isight, mouse, keyboard, web cam, camera, video recorder, speakers and other USB hard drives. Easily back up your computer or upgrade storage capacity, whether on a Mac mini, or another desktop or laptop computer. This multiple-connection companion is plug & play, cross-platform and ultra-quiet. Its sturdy metal casing provides advanced heat dissipation and its unique four-corner crown is designed to provide cooling airflow between stacked drives to protect against overheating. 6.5" x 6.5" x 1.8"